The Korean War, which spanned the years 1950 to 1953, claimed millions of lives, involved over a dozen nations, and nearly led to a Third World War. The casualty figures below represent only military casualties, and does not include North and South Korean civilians, whose numbers are estimated to be in the millions. Of all the UN nations involved in combat in the Korean War, all but Turkey (neutral), and Columbia (not involved in combat) were significant participants in World War Two, which had just ended less then five years before the Korean War began in 1950. Also, of the UN nations involved in the Korean War, several had been involved in other wars and conflicts in the short period of time between the end of World War Two and the Korean War. The United Kingdom had been drawn into combat in several areas, in 1945 and 1946, including the early stages of the Greek Civil War, the early stages of the Indochina War, and the Indonesian War of Independence. Conflicts the British were engaged in at the same time they were fighitng in Korea includes a war in Palestine (1944-1948), the Malayan Emergency (1948-1960), a brief war with Egypt (1951-1952), and the start of the Mau Mau Insurgency in Kenya (1952-1956). France also had engaged in several conflicts between World War Two and Korea. These French wars include putting down a rebellion in the French colony of Syria (1945), crushing a rebellion in the French colony of Madagascar (1947), and, in the most significant French war of the decade after World War Two, the major conflict in French Indochina (1946-1954) in which France lost a war to Communist Vietnamese forces allied to the Soviet Union and Communist China. The Netherlands had attempted to re-assert colonial rule over the Dutch East Indies colonies, but lost the Indonesian War of Independence (1945-1949). Greece endured a bitter civil war against Communist rebels from 1945-1949. *The Soviet Union was not an official participant in the Korean War, but in reality, the Soviets had over 72,000 military personnel in North Korea, and hundreds of Soviet Air Force pilots secretly flew combat missions against UN forces. The Soviet pilots flew in planes with North Korean or Chinese markings, and at first were forbidden to speak in Russian on their radios. Eventually, this directive was changed, and American and other UN forces could clearly hear the enemy pilots speaking Russian to each other. While the U.S. military and government knew the Soviets were intervening in combat in Korea, the decision was made to keep it a secret from the public. According to a book written by a former Soviet officer, titled Soviet Casualties and Combat Losses in the Twentieth Century , Soviet losses in Korea amounted to 299 men (mostly pilots), and a loss of 335 Soviet-piloted planes. In the years between World War Two and the start of the Korean Conflict, all three Communist participants had engaged in various military actions. China endured a continuation of the bloody civil war between the Nationalist goverment of Chiang Kai-Shek and the Communist forces led by Mao Tse-Tung after the surrender of Japan. From 1945 to October of 1949, the Chinese Civil War was waged, with the Communists taking over mainland China and the Nationalists retreating to the island of Formosa (better known now as Taiwan). In 1950, the People's Liberation Army (the Communist Chinese military) invaded and occupied Tibet. 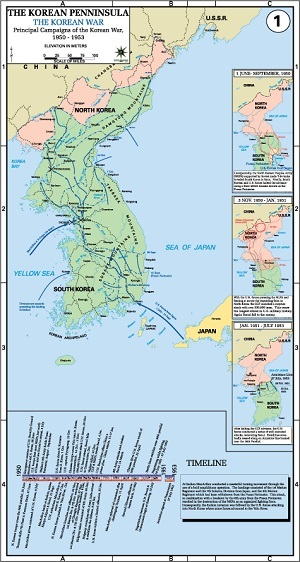 Prior to the invasion of South Korea by the North Koreans, the two rivals had engaged in low-level cross-border conflicts for several years. After World War Two, the Soviets consolidated their hold on Eastern Europe, while the Soviet military also fought against anti-Soviet guerrillas in the Ukraine and Baltic States regions.